The Danvers Rail Advisory Committee is a Town Manager appointed committee of nine volunteers with broad representation from the community. Created in July 2009, the Committee's purpose is to advance the utilization of the abandoned railroad corridor in Danvers through the development and maintenance of the Danvers Rail Trail along a portion of what was once the historic Boston to Maine railroad line. The Committee's role includes efforts to obtain grants and other funds in support of the trail's development with the goal of minimizing any expense to the Town; community and abutter outreach; working with the MBTA; acting as a liaison with other communities to expand trail connectivity. 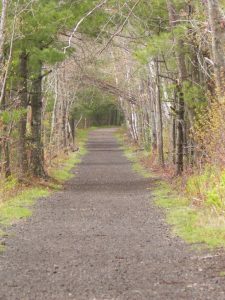 At 4.3 miles in length, the Danvers Rail Trail is ideal for walking, biking, or jogging and connects Danvers residents to each other and to nearby communities by linking schools, downtown Danvers, parks, residential areas and trails in the neighboring towns of Peabody, Wenham, and Topsfield. The Rail Trail Advisory Committee meets the third Thursday of every month at 6:00 p.m. in the Toomey Room at Town Hall. Please check the event calendar for any changes to these meetings. The design and maintenance of the Rail Trail website is donated by Mead Web Design. Danvers Rail Trail Mobile App! Download the Danvers Rail Trail Mobile App from the Apple and Google/Android stores! All you have to do is search in the app stores for danvers trail & download.